I’m pleased to report that I was able to get an emergency appointment at my dentist this afternoon so didn’t need to add the dental hospital to my list of A&E’s visited this year. Having been poked, prodded and x-rayed, nothing untoward was found so she decided to remove the existing filling just in case it was leaking. While she was busy drilling it occurred to her that she could do the small filling and polish which were still outstanding *. Fingers crossed my tooth will be ok as I don’t have much luck when it comes to toothache. The last two occasions resulted in paying a fortune for the pleasure (or should that be torture ! ! ! ) in having them removed. * My original appointment was 13th February but couldn’t make it because of my ankle. It was re-scheduled to 8th May but my dentist slipped a disk in her neck so the next available appointment was 25th July. The toothache started in one of my lower back ones, then worked its way up to the upper teeth and ending at my upper front ones. I took some painkillers and it settled down for a while. When I woke up on Sunday the pain had gone. My yippee turned into oww the second I took a mouthful of orange juice. The pain has now decided to put all its energy into one of my upper front teeth. So tomorrow morning I’m going to have to either ask my dentist for an emergency appointment or it’s a trip to the Dental A&E. The tickets for our holiday arrived today. Now that may not sound much, but when you book with Silversea they come in a nice box covered in silver foil, and the tickets themselves are in a leather wallet, together with much more information about the cruise itinery. So far so good. No, we didn't get a wet floor, but we had a very full bath. Full of VERY hot water. So all Marie had to do was let some out so she could put some cold in. Except how do you put the plug back in if the water is scalding hot. Then I had this idea. Many years ago Marie was immobile after an operation. The hospital gave her one of those "grasper" tools with a handle on one end and a pair of grips on the other. Just the thing to plunge into the water, remove the plug, and replace it after letting out the right amount of water. OK, so it's not exciting, but it's not as bad as yesterdays joke. A couple go for a meal at a Chinese restaurant and order the "Chicken Surprise." The waiter brings the meal, served in a lidded, cast iron pot. "Good grief, did you see that?" she asks her husband. He hasn't, so she asks him to look in the pot. He reaches for it and again the lid rises, and he sees two little eyes looking around before it slams down. "Please sir," says the waiter, "what you order?" The husband replies, "Chicken Surprise." "Ah... so sorry," says the waiter, "I bring you Peking Duck." Yesterday we had to go to down to London for a meeting. We had to be in London for 11am and as GNER were yet again doing engineering work, the rail network was a shambles. So we had no option but to fly. Bleary eyed, well wouldn’t you having got up at 4am… we arrived at Newcastle airport and because of the wonders of the internet didn’t need to check in having already reserved our seated and printed off the boarding cards the night before. For once we both got straight through the metal detector at the security gates. I usually set them off but that’s what you get when you have a metal hip ! ! ! We weren’t so lucky with John’s bag as there was something inside they didn’t like. ‘Oh it’s probably the stapler. It always looks suspicious’. ‘Not this time, it’s a pair of scissors’. ‘Scissors’, we both cried then tried wracking our brains as to how they could end up in John’s bag. It turns out that they were a very old pair of kitchen scissors that John kept in his tool bag. They must have fallen out when the bag was last used at Blackpool conference. The little security man said we couldn’t take them with us, but we could either get a jiffy bag and post them home or check-in John’s bag. Considering the cost of posting them home or the hassle of checking in the bag we decided to leave them at the airport. Last night was the first time since Gertie came to live in the Bogof household that I’ve have time to ‘programme her in’, so to speak. 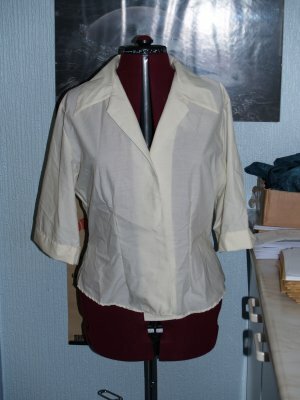 For those of you who don’t know what a tailors dummy is, it’s an adjustable mannequin which is used to aid dressmaking. John very kindly helped measure my vital statistics and these were then put into Gertie. She still wasn’t quite my body double as I don’t have a small bust or a washboard stomach so this morning she became the proud owner of a padded bra and a spare tyre around her middle. If this is not an incentive to diet I don’t know what is ! ! ! Regular visitors to our blog will know my mam is a little quirky. Yesterday was a good day. It started with the milk. As you know she is obsessed about milk and best-before dates. Well, I noticed the coffee was a little creamy (you would just think it had been made with full cream instead of semi-skimmed) and I made the mistake of telling her this. As she put the milk back in the fridge I noticed the thermostat was lower than normal so mentioned this as it could have been the cause of the creamy milk. Bad move. I tried to convince her that the food would be fine as the dial was only down two notches. No doubt her wheelie bin had a good feed that night. On Monday she asked if she could try on one of the pairs of trousers I was sending back to my catalogue. She was already keeping a black pair in the same style so wondered what the stone one would look like. Having tried them on, they were too big. She then decided that she might not keep the black pair as she had gone off the idea of wearing them seeing as the stone ones didn’t fit. Don’t ask ! ! ! Then she took both pairs and laid them on top of one another. Even though the black pair fitted perfectly, she was adamant that if they were the same size then the black pair was going back. Again don’t ask ! ! ! In case you were wondering why there was no picture of Gertie on the blog, all can now be revealed. I re-installed windows not so long ago and forgot to re-install Explorer Version 6. And with a low-5 version you don't get the Blogger post editor toolbar, and without that you can't add pictures. It's now done, so here's a picture of Gertie for you. I'm sure everyone will be pleased to know that Gertie has settled into the Bogof household very quickly and has already proved to be a great asset. Every home should have one !!! As Jan quite rightly said on Saturday night we are ‘boring old farts’ for not blogging so thought I’d put one together. Well it was either this or do some hospital radio work. The former wins hands down ! ! ! We never did get our early night last night as we stumbled across a programme on Channel 4 about one hit wonders so stayed up to watch that. John had to take his car in for a service and MOT this morning and as I had to pick him up from the garage and take him to work it meant an earlier than usual alarm call. Once back from my mams (it was only a flying visit to drop off some bottled water and a couple of pairs of trousers) I then had to catch up on some three letter word * stuff. This afternoon was spent in a more pleasurable way – watching more of my new Buffy DVD’s. Normally at this time I would be looking forward to a glass (or two) of wine but we’re back on our diet so no wine tonight. Grump, grump. Having got told off this weekend by our friend Jan * for not blogging for ages I thought I better do one. So why am I exhausted, well we’ve just come back from a wonderful weekend away in Derby/Nottingham for the wedding of our friends Chris and Jenny. An early night is called for ! ! ! * It was more on the lines of ‘you haven’t blogged for ages you boring old farts’.